Situated less than an hour’s drive from the city centre of Johannesburg, Muldersdrift offers its visitors respite from the hustle and bustle of the city. With the Magaliesberg Mountain Range as your backdrop, the tranquillity of the area is sure to refresh your soul and provide ideal conditions to get the creative juices flowing at your next business meeting or conference. Although one gets the feeling of being far from civilization, Muldersdrift is, in fact, situated within easy access of various popular suburbs in Gauteng such as Fourways, Sandton, Randburg and is less than an hour’s drive from Pretoria. The Lanseria Airport, which has flights to and from Cape Town, is also only 15 minutes away from Muldersdrift. The town itself no longer consist only of small farms and smallholdings but has developed into a village in its own right. Its borders slowly merging into the suburbs around Northgate. The country atmosphere of Muldersdrift, combined with its easy access from most of the major centres in Johannesburg, makes it ideal for conferences, business meetings, brainstorming sessions and team building events. Although the area is well known for its over 40 wedding venues, it is also home to some of the province’s leading conference venues. Some recommended venues in the Muldersdrift area include Valverde Country Hotel, Glenburn Lodge, Avianto, Kloofzicht Lodge, Ingwenya Conference Centre, Misty Hills Country Hotel Conference Centre & Spa, Heia Safari Ranch, Moon & Sixpence, Apricot Hill Farm and Silverstar Casino. Situated in the heart of the Kromdraai Valley, Muldersdrift is home to the Cradle of Humankind which has been proclaimed a World Heritage Site. The area is world renowned for its archaeological discoveries and houses the third largest cave in South Africa. The Wondercave consists of only one chamber, but this chamber is large enough to fit in an entire football field. The cave goes down 40 meters and can be accessed by the public through an open lift or, for the adventurous, one can abseil down into the cave. The inside of the Wondercave is truly spectacular with cave pearls, pools and 15 meter high stalagmites. In this area of Muldersdrift, you will also find the Cradle Private Nature Reserve. The reserve offers you nature at its pristine best with indigenous forests and tranquil streams inhabited by a variety of wildlife such as Antelope, Giraffes and Zebras. For the wildlife enthusiast, the 1200 hectares of the Rhino and Lion Game Reserve in Muldersdrift is a must visit. The game reserve offers the visitor an opportunity to see the big game such as Rhino, Lion, Buffalo and Hippo up-close. Plan your visit around feeding time and you will see these magnificent animals feeding on carcasses provided for them, a truly unique experience providing excellent photographic opportunities. Another highlight of a visit to the Rhino and Lion Game Reserve is the lion cubs. The cubs are part of the reserves breeding programme which include other species such as Cape Wild Dogs, Bengal Tigers, Siberian Tigers and White Lion. At the Vulture Restaurant carcasses donated by local farmers are fed to the Vultures in the area. The process can make spectacular viewing as up to 200 vultures can be seen feeding together. Another popular place to visit in Muldersdrift is the Ngwenya Glass Village. Here, one can see a demonstration of the ancient art of glass blowing, and there is also plenty of fascinating things to see and buy in the village’s 12 shops. There are also numerous other arts and crafts shops and roadside stalls throughout Muldersdrift. Muldersdrift has not only an prominent place in world history, but it also has significance in the history of South Africa. It was in this area that Dr Jameson was caught by the Boer Republics and arrested as a prisoner of war. Dr Jameson headed up the failed Jameson Raid which was intended to trigger an uprising by the predominantly British expatriate workers in the Transvaal. If you are looking for a place near Johannesburg in which to hold your next conference, corporate event or business meeting, Muldersdrift is the ideal place. 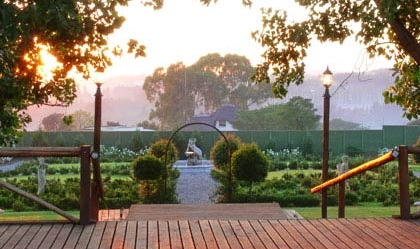 It is in proximity to all the leading centres in Gauteng but still offers delegates the experience of a getaway in the countryside. There is no shortage of venues in Muldersdrift to choose from to host your event.